Just like everything connected with my Dad’s childhood, his school experiences were not remotely like mine or anyone else that I knew. First of all, his long ‘summer’ holiday was from December to early March. This was the so called cool season in Burma (I was there in January and the daily high temperature averaged 90 degrees Fahrenheit!) All the studio photographs I have of him and the family were taken during these months. They always included one of the two brothers in their school uniforms. Until they were eleven years old they attended a local school called The Diocesan Girls’ School, despite there being a Diocesan Boys’ School. From the pictures it seems to be co-ed, and there are more Minus cousins attending, so maybe it was just tradition to send family there, or maybe it was closer to the house, I don’t really know. Dad had no stories to tell about this school so it was a lovely surprise from Arthur when he sent me this photograph. Diocesan Girls’ School. Rangoon, 1932. Dad is front row, second from right. Arthur is back row, second from right. 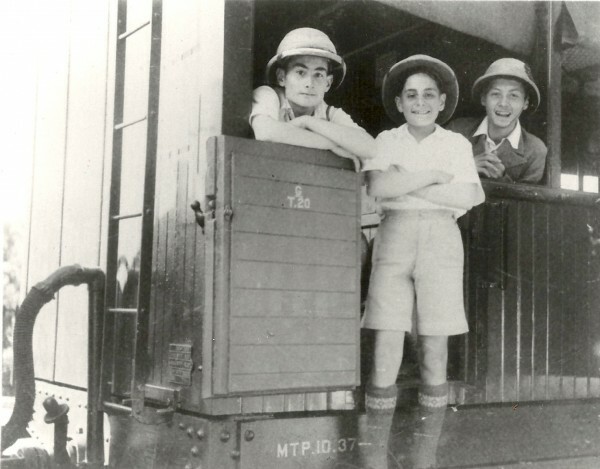 After turning eleven, each boy was sent to private boarding school in India. 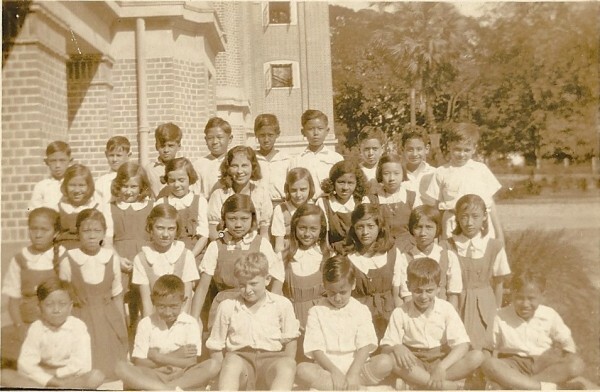 Arthur, the oldest, spent two years in Darjeeling at St. Paul’s School. When Dad was of age, both boys were sent to The Lawrence Memorial Royal Military School, situated in southern India, high in the Nilgiri Hills. Dad always referred to it as “Lovedale,” which is the name of the nearest railway station. These schools were run very much on British boarding school lines, with a bit of military instruction thrown in at Lovedale. Imagine you are their mother. You have to organize the purchase of their uniforms, other clothes, toiletries and supplies into a tin trunk each, because they won’t be coming back for nine months. You make sure they have haircuts and their photos taken. You admonish them to behave and to write to you weekly. You then accompany them on their three day journey across the Indian Ocean to Calcutta, catch the train at Howrah Station, get the connecting train at Madras, then finally board what is fondly called the Toy Train that tackles the switchbacks of the mountain by going backwards, to eventually arrive in Lovedale, three days later. 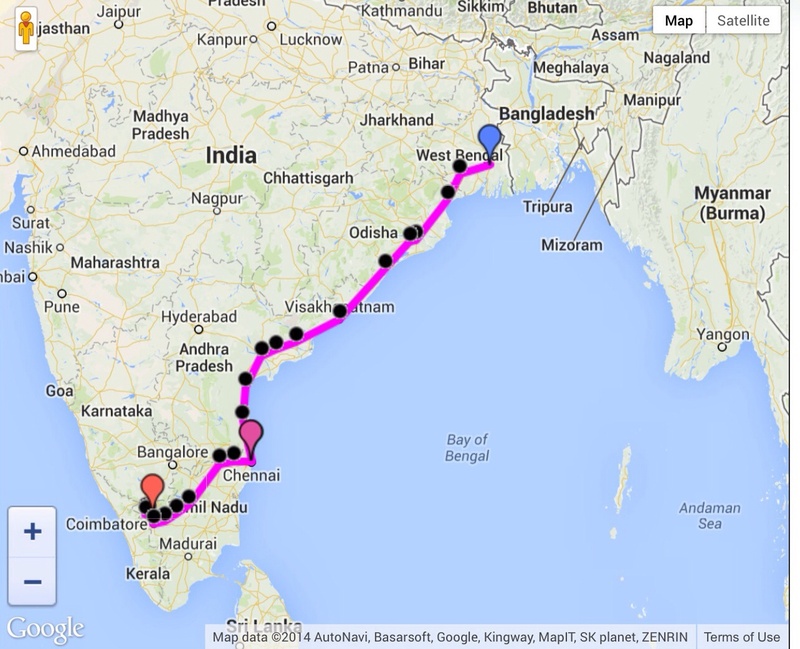 Dad and Arthur (and later, Shelagh, their younger sister) did this journey unaccompanied by adults. In an upright seat, not a sleeper. They were met at the Calcutta docks by an uncle and transferred to the train station, but that is it. The boat journey had lots of other children with parents going to India, plus regularly scheduled meals, so that wasn’t too bad. The train journey, however, is the source of three of Dad’s greatest stories. Sounds like Rudyard Kipling, doesn’t it? Come with me O My Best Beloved, and I will tell thee a tale of the Mischievous Monkey of Metupalaiyam. He did not eat in a dining car. Dad laughed himself speechless when I asked him if he did. He was given a small sum of money at the start of the journey to be spent buying food from the itinerant food sellers you see at every Indian railway station, the chai wallahs, mango sellers, dosai peddlers and others. 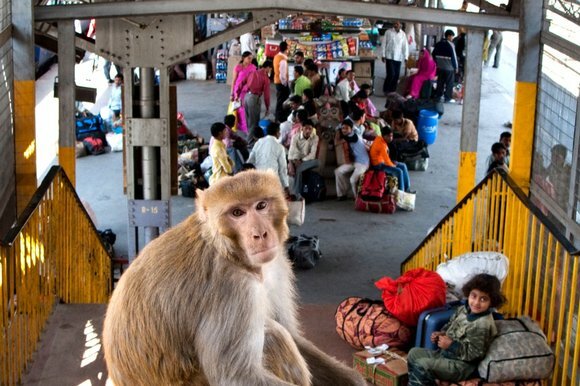 Sitting in his compartment at a railway station he had just purchased a snack through the window from a peddler with a tray of treats carried on his head. Dad turned to put his change away and turned back to see a monkey swoop down from a nearby tree, grab his food and escape. That was that until the next stop, although knowing Dad, I expect he turned his big brown eyed charm onto the other passengers in the compartment and cadged some food. a) He had an unorthodox method of entering the carriage. b) He had a great curved knife clenched between his teeth. For a moment everyone froze. Just as the budmash got his lower legs into the carriage while his upper body was still outside with his hands clinging to the window edges, a gentleman got up from his corner and pushed him powerfully in the chest. 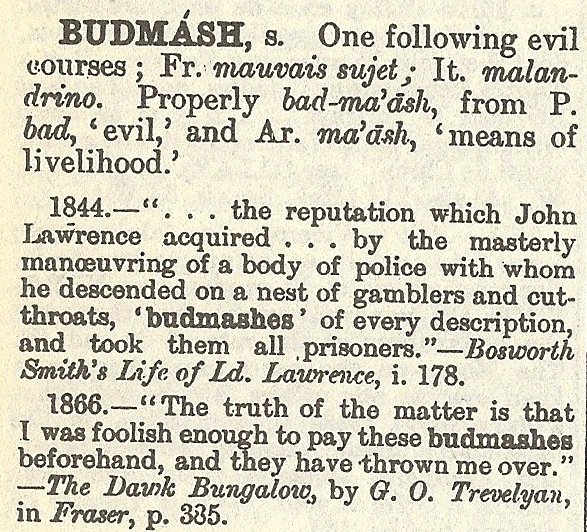 The budmash dropped from sight as the train was now running at speed. The gentleman dusted his hands and received congratulations from the little travelling party with modesty. Arthur, Norman and a friend on the Toy Train in Lovedale. December 17th,1937. Dad turned 15 the next day. This train is now famous as a tourist must see, but to Dad and his schoolmates it was the last stage of the journey to school. It operates on a very narrow gauge of 1 m, isolated from any other gauge, as well as using a toothed rack on the steep bits. From Metapalaiyam it runs about 29 miles, rising to 7000 feet at Lovedale, its penultimate stop before the final station, Ootacamund. It is now a UNESCO World Heritage Site. Hogwart’s Express, eat your heart out. For train spotters read more here. Hope Grant House at Lawrence Memorial Royal Military School, 1937. 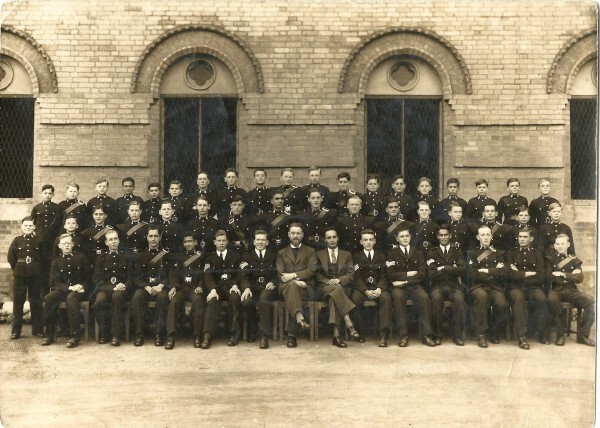 Dad is sixth from the right in the back row, Arthur is third from the right in the middle row. Many years after graduating, Dad made contact with some of the old boys through an alumni group. In 1997 he toured the school again, where much had remained the same. A friend had written a book about his life in the school and Dad was thrilled to find he had been mentioned in it five times. I will save those stories for another post. 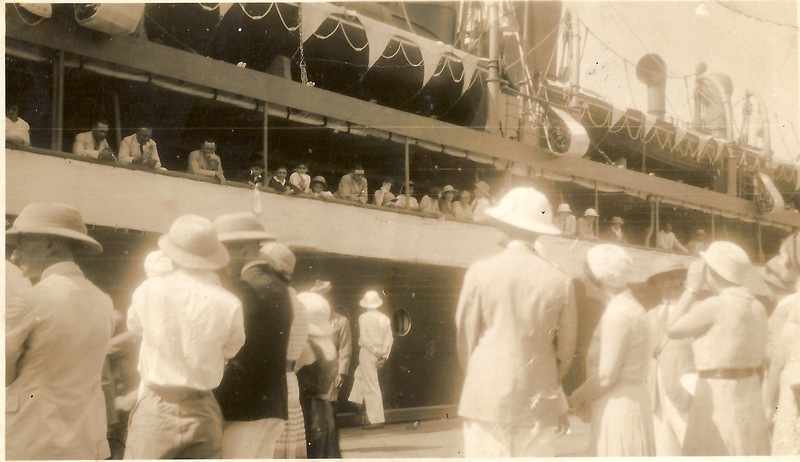 This entry was posted in Family Story and tagged Budmash, Lawrence Memorial Royal Military School, Lovedale, Ootacamund, The Diocesan Girl's School in Rangoon, The Lawrence School, The Toy Train. Bookmark the permalink. Under someone’s front lawn? I suppose under occupation normal burials were difficult. As it is, the cemetery is gone completely now. I haven’t come across the name “Emin” but there were many Armenians in Rangoon in the 1920’s. I will keep on the lookout for that name. Some of us Old Lawrencians are writing a history of the School. I would like to seek your permission to use the pictures you have of your father in this post. It would be kind of you to reply to me (email blanked for privacy) Thank you! amazing to read about your father’s school days. My father was at the Lawrence School from 1930, but not sure when he left. He told us many stories about his years in India. I have a copy of the school enrolment register 1858 to 1954 and was thrilled to see my fathers name at the bottom of one page. I have no photos though, but would love to see some. Please email me if you have anything I might be interested in. Sometime this year I hope to scan all my dad’s photos of the school and post them on a dedicated page on this blog. He did not enrol until the mid 1930’s as previously he was at La Martiniere in Lucknow. Have you ever thought of scanning the enrolment register and posting it on the Internet? It would be a very useful reference for many people. I downloaded it from the internet, be happy to forward it to anyone interested. I am thrilled that you have so many photos of the school on your website. After just a quick look I saw ‘Punch’ Hackett, a friend of Dad’s, and Teedie Robbins, his first girlfriend. Also, the picture of Hope Grant House is the same one I have, with both Dad and my uncle Arthur in it. I have quite a few photos which are scanned, but not up yet. One of the commenters on the blog said they are doing a new history of Lovedale book, so I sent him some photos. You are welcome to use the train photo. I was once told the name of the third boy, which I have now forgotten, but apparently he died in WWII. Hello, I am getting back into some family history research and stumbled upon your site. My grandfather, George M. White, went to Lovedale from March 1931. I have a number of photos, not sure of the dates, of groups of boys from Lovedale. I’m wondering if you’d be interested in taking a look and whether you could add any information – maybe a guess on dates? I think my dad’s time at Lovedale may not have overlapped with yours. When did your dad leave Lovedale?